By Allison Owen I ended a chapter of my life this weekend. To some it may seem like not much, but to me it was quite a big deal. I've said it before: I'm a band nerd. For four years of my life I've sat at football games on Friday nights to cheer on the team -- win or lose. For four years I performed in numerous halftime and pregame shows to sometimes nearly empty stands. For four years I spent my weekends during the fall at competitions or rehearsals. For four years I spent countless hours on a practice field wishing for the end to arrive. Now that time has come and I can never get it back. 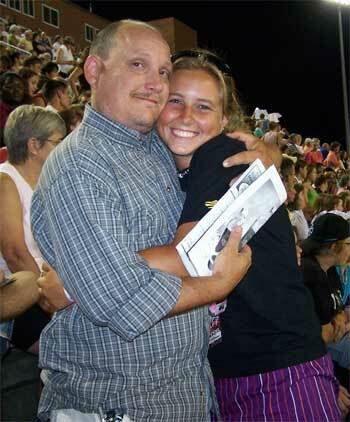 Allison Owen and her band director, Mr. Dye. As easy as it is as a drum corps member to dislike marching band, I've come to enjoy it this season. The group of kids I've been privileged to be around has changed my outlook on life. It's been a very rough and frustrating season for us all. I really wasn't sure we would make it though to the end. But we did and I'll never be in high school band again. It's bittersweet because I waited so long for it to be over, but I actually did enjoy it all this year. I have never been so proud of anything as I was of my flag line this weekend. When I got home back in August, there were a few girls that had absolutely no clue what they were doing. Frustrated beyond belief, I struggled with them all season, yelling the counts during practice and trying to help them figure it out. Saturday they came together for one last performance and everything just clicked. It truly took us all season to figure it out, but when we did it was beautiful. I think that's why this season meant so much to me. All the frustrations I had were finally justified by the beauty of the finished product. It's pretty surreal to think that I'll never do that stuff again with those people. As emotional as this was for me, I can only imagine how I'll be when I age out (2010, by the way). I've come to realize that I don't handle the end of things very well -- no matter how long or short I've been a part of the activity. It's really hard for me to do something for a while and then one day just not be able to do it anymore. Sure, I can do college marching band, winter guard, etc, but it's not the same. Each activity is its own and means a little something different to me. I've been very blessed to participate in some great programs over the past four years. I just finished my ninth show of the marching arts activity -- band, drum corps, winter guard, and indoor percussion -- and I'm about to start on my 10th. Even though there have been some rough times, it's been great for me overall.